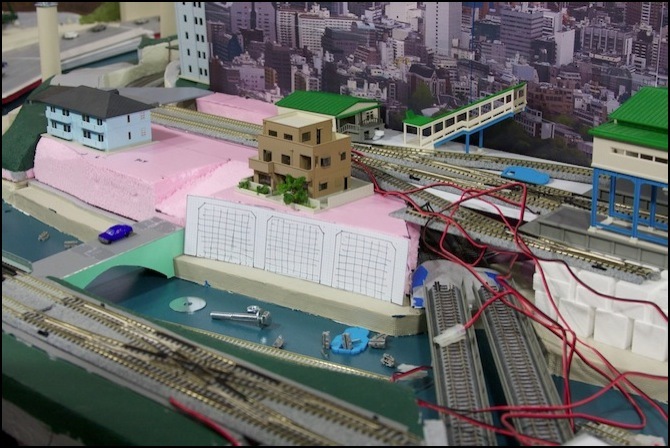 The JNS Forum held a construction contest, with the theme of “stations” (any kind, train, bus, what have you). The contest started with a planning phase, and actual construction began 1 August. Actually, despite the letter of the published schedule, it appears that construction could start as early as 16 July, and people began planning what they would do even earlier (as did I). Not that it mattered, as I wasn’t ready to start by August 1st anyway. 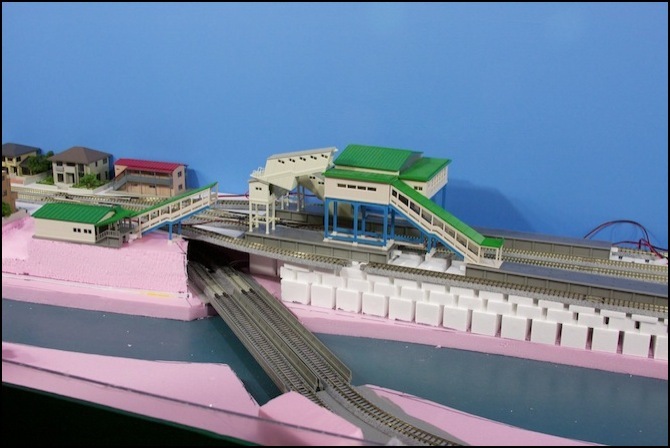 I used this as an opportunity and motivation to build my most complicated station: the Commuter Line station of the Riverside Station scene (I eventually gave it a name, “Kawate Station” meaning “Beside the River” in Japanese). 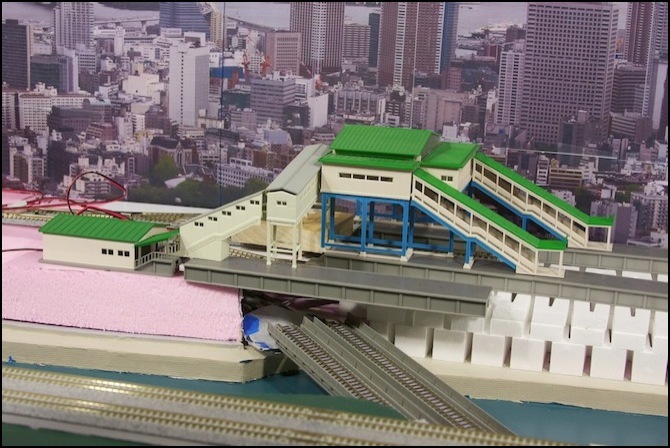 This scene is loosely based on Ochonomizu Station in Tōkyō. 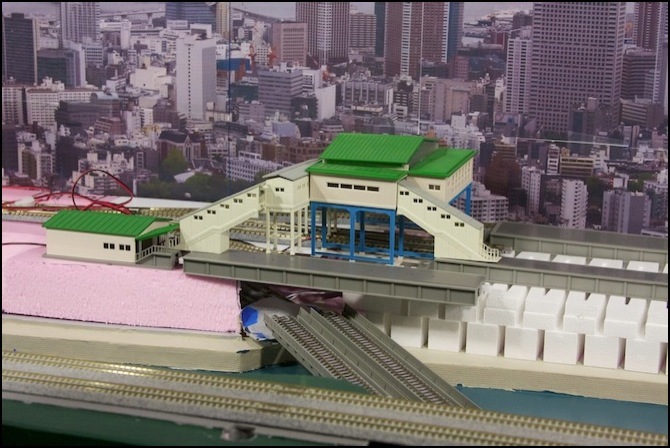 There are a couple of photos of this station on my Train Stations scenery page, but I’m not going to try to replicate the exact look. 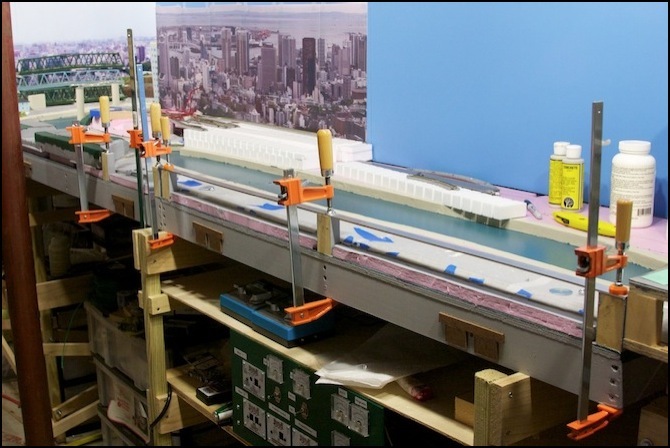 For one thing, the prototype is entered from above, with stations on a road paralleling the station and on a bridge crossing over it. There’s no room for the former, and while the latter is interesting, it doesn’t quite fit my scene. 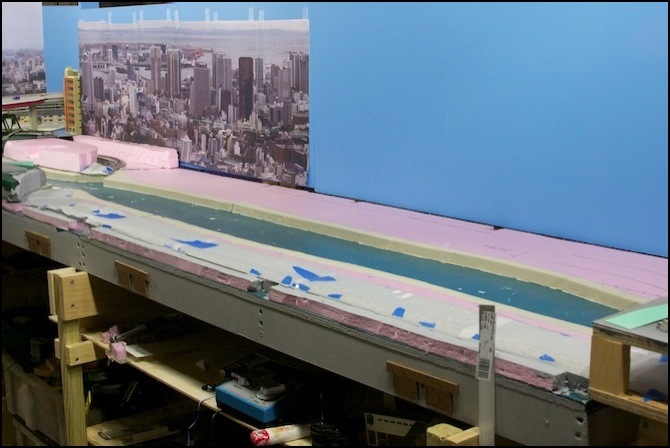 You can see the complete layout on the Track Plan, but here’s an excerpt showing the two four-foot long by two-foot wide tables (plus a bit to the left and right, as the scene extends beyond the two tables). The yellow tracks are the commuter line, and the blue are the branch from it to the subway (connecting off to the right). The red tracks are the subway itself, out of sight except where it crosses the river in front of the station. In Japan, and particularly in Tōkyō, a number of subway lines have connections with suburban lines to allow commuter trains to reach the heart of the city. This does require specialized trains due to the smaller tunnels and platforms of subways, but it’s facilitated by the use of 1,500 volt DC from overhead wiring on most subway and suburban lines. The actual area to be detailed for the contest is smaller. I’m going to focus in on the entrance building (the brown square in the lower left, unless I move it) and the platforms (the two gray rectangles). 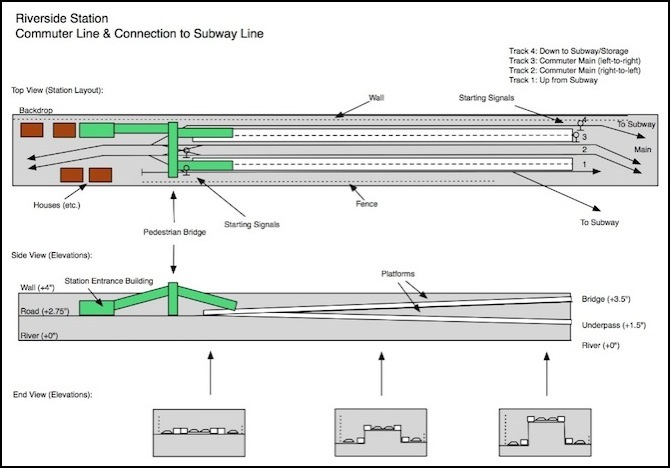 What makes this particularly complicated is that the yellow tracks follow a 2% grade that rises from left to right, while the connector tracks follow a 2% grade that drops from left to right, allowing the connector to pass beneath the commuter line at the far right. The large numbers (e.g., “+2.25”) are inch elevations above the river level. The lower layer of foam is 0.75”, so 2.75” means one 2-inch Woodland Scenics Riser. What this means is that in the space usually used for an island platform, I actually need two half-platforms, at different levels. This will add detail (a concrete wall, likely dotted with advertising posters, as well as a guardrail, and maybe stairs between levels), but it means a kitbash (combining two standard kits into a different structure) at a minimum, and perhaps just building the platform from sheet styrene and similar parts. The station itself will have two split platforms: at the left end the tracks are at the same level, and the two half-platforms meet at a stairwell to an overhead pedestrian bridge. At the right end, the platform halves are significantly far apart (two inches, which is 25 feet or 7.6 scale meters). In addition to the platform and building, there will be a wall behind the station, to provide a slight visual break from the backdrop. There will be starting signals (signals controlling the exit of a train from the station) on each of the four tracks. There will also be various small details, such as fencing, wiring conduits along the track, advertising signs, etc. So, what does this look like to begin with? It’s not very inspiring: in the photo below, the covered tracks in the foreground and exposed at the left rear are the subway line. 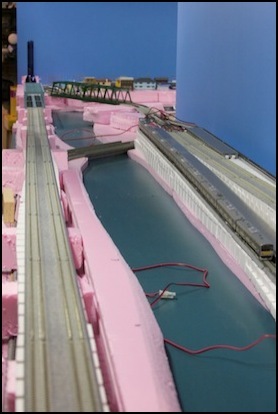 The broad plain of pink foam is the home of the planned station. Planning actually started some time ago (before I had the track plan settled, last winter), with track and platforms being mocked up to see how it looked. In the photo below, taken in the spring, a ten-car Sobu line 205 commuter train waits on the outer connector track, with some Kato platforms alongside the track for spacing. 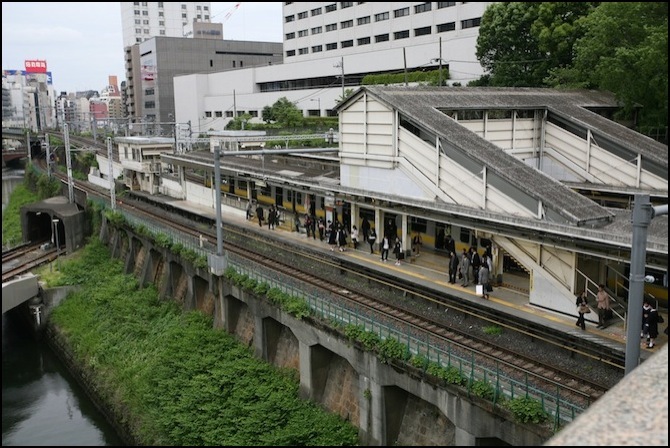 The long track on the left is the Rapid/Shinkansen line, which runs above the subway here. And here’s a possible station and entrance building (I’m still undecided if I want the station building over the tracks, or just a simple pedestrian bridge). I’d need to kitbash the two green-roofed structures with the gray-roofed bridge, to connect all the parts together, and I’m not yet convinced this is what I want to do (although I’ll almost certainly keep the green-roofed entrance building on the left, as it’s both very prototypical and fits the space I have. Passenger footbridges of some kind will be required, beyond that I’m still a bit vague on my plans. The formal start of the contest. At present there’s a plain of pink foam, and nothing else where the station will go (the bank of the green river adjacent to the blue backdrop). Construction officially started yesterday. I’m not even close to ready. I’m still working on the Subway Station (and more specifically, its roof, which will hold up the Rapid/Shinkansen tracks. I have been giving the station design some thought, and the ideas are starting to come together. I hope to make a start on it this week. Very little progress has been made. 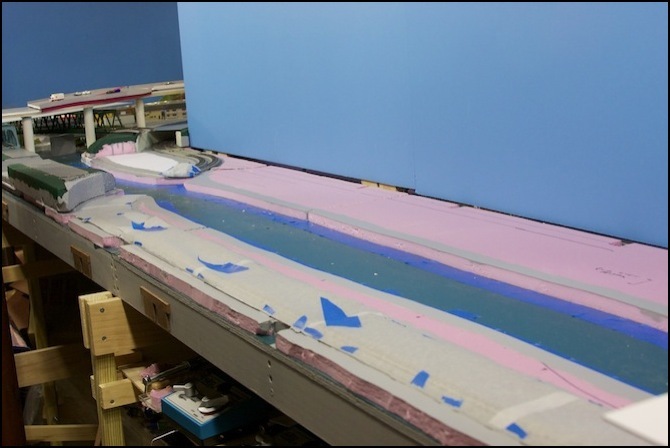 I do have a plan for the edging of the foam (that pink wall on the left in the photo below, and the white wall on the right) which involves making a retaining wall master in styrene and casting sections I can cut to height and glue to the foam. Supplies have been acquired to begin construction of the master shortly. But mostly I’ve been working on other parts of the layout, and staring at the tracks and going “what should the station look like?”. Below are three test mock-ups reflecting my current thinking: #1 has the green-roofed station entrance on the left, a staircase (gray roof) up to a walkway that crosses the tracks, and the green roofed station building. The problem with this design is that the height is wrong to use the green-roofed stairs down to the platforms, so I need to use the gray-roofed one that cam with the pedestrian overpass. Unfortunately, I’d need three of these, and have two, so I’d need to buy another overpass. Not a serious problem, but I want to be sure of my plans before I do. 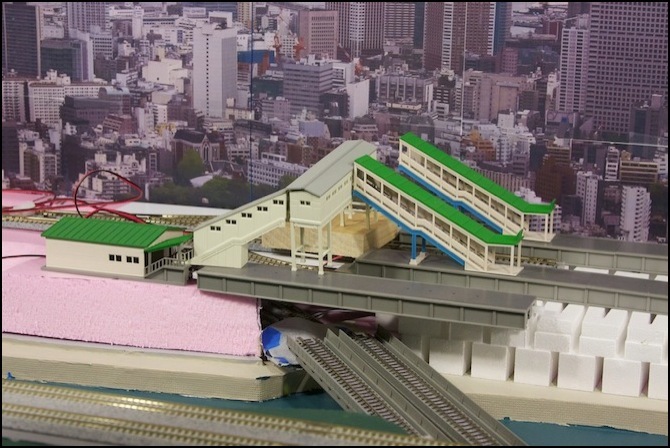 Test 1: Station using building above tracks, mounted at ground level. Photo 2 is similar, except that the building mounts atop the platforms. That makes it a bit high relative to the trains, but lets me used the green-roofed stairs (I’m left with an alignment problem with the pedestrian walkway, but I can put that at an angle, or build an angled junction with the station building to imply interior stairs. BTW, the platform in the foreground, spanning the subway tracks is just temporary. The eventual support legs will go down to the subway tunnel roof, whatever I do. Test 2: same building, but atop platform. Photo 3 gets rid of the building, and just uses the pedestrian tunnel. The alignment problem can be fixed by cutting the green-roofed stairs a bit short. Test 3: Just a simple walkway above the tracks. Of these, I’m inclined towards #1. As an urban station, I really need more of a station building than just the little one off to the left. Plus it emphasizes the vertical aspect of the station to have the station building above the tracks, which are above the subway, above the river. And, aside from the river embankment, this scene is short on “vertical”. I’ve added larger versions of these photos to the Scenery Photos album. Whatever I do, the buildings will undergo a bit of surgery to make all the bits fit together, and will be disassembled and painted to get a flatter, less plastic look. I’ll also give the interior a couple of coats of paint (black for opacity, then some bland color as wallpaper), add some figures where they can be seen through windows, and at least one white LED per building for lighting. Exterior signs in a couple of places where they’d be visible are also planned. I’m still not sure I like the backdrop photo. I may replace it with something else, if I can find something else I like better (more of a close-up panorama, shot from ground level or close to it). A month in, and nothing to show for it. I continue to waffle about the station design. Do I want the entrance building in front of the tracks, as above, or behind, as below. In front has the benefit of drawing the eye away from the backdrop. Placing it behind opens up the view of the crossover and switches, and also makes placement of the escape switch (shown below) better. An escape switch (there’s a formal name for them, but I forget it) is coupled to the signaling system where trains approach a switch into another line; if a train without a “clear” (green) indication overruns the signal, rather than fouling the other line, it’s run into a dead end (usually a big pile of gravel leading to a solid concrete end-of-track bumper). The photo below also shows a mock up (done with graph paper) of the abutments I plan to cast. Before I go to all the work of building the master, I want to see how it will look proportional to the rest of the scene. It’s hard to tell, but the top will be level with the pink foam (I’ll add a fence along the edge, I think). Still not much happening. I’ve cast and painted the first retaining wall section (see my Retaining Wall Castings page). 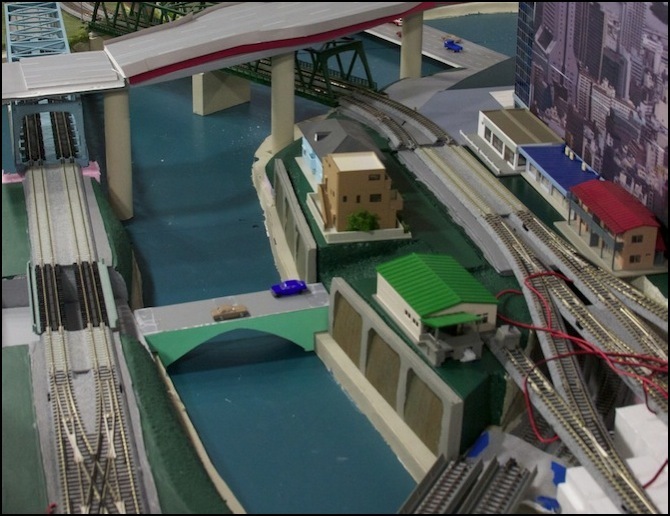 I’m also continuing to work on the other side of the river, to get the Rapid/Shinkansen loop operational. But none of that has anything to do with the station itself. I’m hoping to finish off the block of pink foam in the picture above soon, and glue down the white WS inclines and risers for the station itself, as well as doing some plastering, but that’s all still to-do. The contest ended, and I hadn’t really accomplished all that much. Work on the station continued over the winter, but topography and track wasn’t done until the spring of 2011, and the actual station is still (as of summer 2011) yet to be started. Which is not to say it was a complete loss. I got the front foam painted, as well as the back corner shown above, and the plaster castings for the big retaining wall built and painted. I didn’t actually get the foam for the station track glued down until winter, but I made a significant start thanks to the party.